More about Park Won-soon's pet project, the Seoul Station Elevated Park also known as the Seoul High Line ("Diagonal crossings, High Lines, and Business Verticals (how pedestrians and businesses remodel Seoul... and vice-versa)"). It seems that marketing came up with suggestions for branding, and the good news is that we may not stick to the 'me-too' "High Line". The result could be a 'Seoul Station Project 7017'* reminiscent of the 'Culture Station Seoul 284' it steps across. Come on. 7017? I'm sure you could find something more exciting than this. As a tribute to the vinos at the origin of the project (those who occupied the walkway that will be replaced by this elevated park), I suggest "The Seoul Vine". 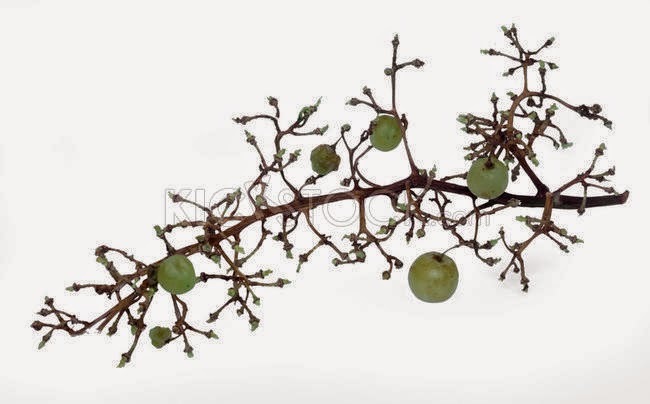 After all, doesn't it look like a grape? 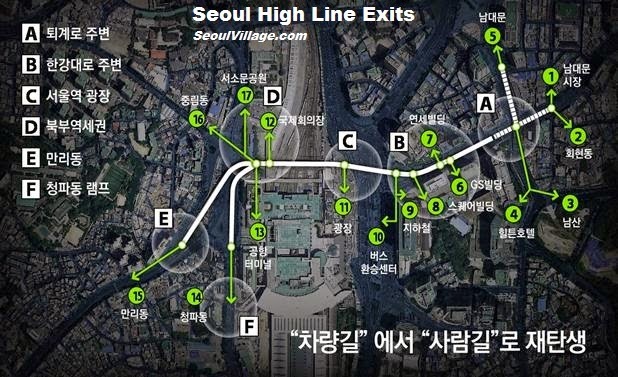 Note that exit #1 is Namdaemun Market: the recent demonstration of merchants against the project obviously paid off! It is followed by Hoehyeon-dong (#2, on the other side of Toegyero), Namsan and Hilton Hotel (#3 and #4, which will require an extension), Namdaemun (#5, with another extension), three buildings (GS Building #6, Yonsei Building #7, Seoul Square #8), Seoul Station subway (#9, it seems around the subway exit 9 too), the bus transfer zone (#10), the Culture Station Seoul 284 (#11), the future International Conference Centre (#12), the Airport Terminal (#13), Cheongpa-dong, Malli-dong, and Jungnim-dong (#14, #15, #16), Seosomun Park (#17). Adding accesses for pedestrians makes perfect sense, but it also means adding many staircases or elevators to the cityscape, and making the main structure look more massive, less aerial than it is - not to mention of course the biomass. Furthermore, nets are considered, maybe to prevent people from jumping or throwing things at the traffic below. And what about these new extensions towards Namsan and Namdaemun? What's the point of removing Cheonggyecheon overpass or aiming at a spot on the Unesco World Heritage List for the Seoul Fortress if you add more elevated structures next to a landmark like Sungnyemun? And what about the new bridge considered to accommodate the 50,000+ cars taking this elevated road every day? How far and how high will it fly? At this stage, I'm not saying a big NO to this project, which has the potential to be both a lovely ride and an urban nonsense, but in less biblical dimensions than the elevated heresy envisioned a couple of years ago for Seochon (see "No cablecars in Bukhansan, please"). I'm simply saying this: be cautious, think about the long term impacts for the city and its citizens, and don't think you can fix a mess at ground level** by just rolling out a nice rug on top of it. ** e.g. see previous episode. 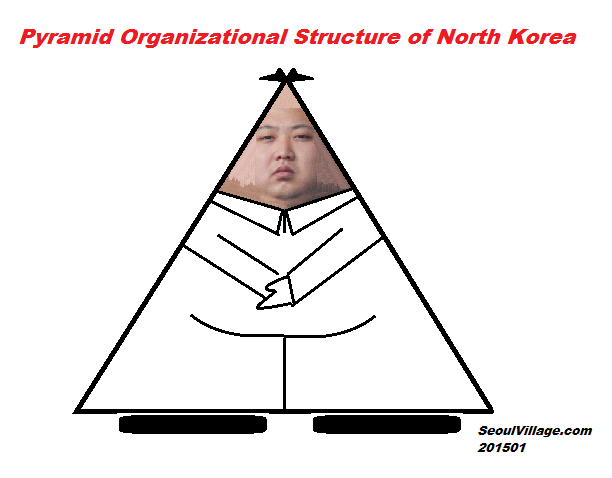 Obviously, this is not a right triangle: the sum of the squares of the lengths of the two legs is not equal to the square of the length of the Kim Jong-un's nose. Seoul keeps at the same time looking for more sustainable urban planning approaches, and doing more mistakes, because as usual in this city we tend to try a lot of things, but seldom after serious impact surveys. At least that's far less boring than my other hometown Paris, where we tend to make decade-long impact surveys, but seldom do something else. 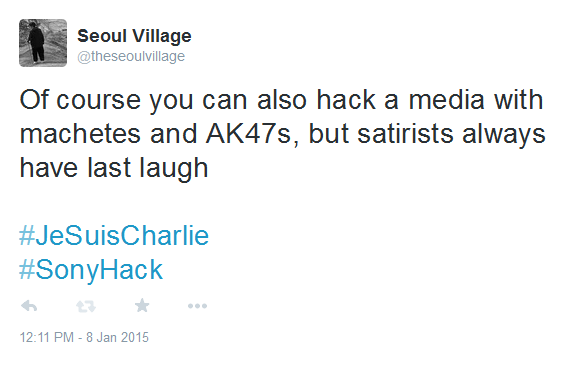 As you well know, a Seoulite born in Paris, I tend to pile up useless bits on an ever changing cityscape. Here's a batch on recent evolutions for Seoul pedestrians and neighborhoods, with the Seoul High Line project as a natural bridge in-between. 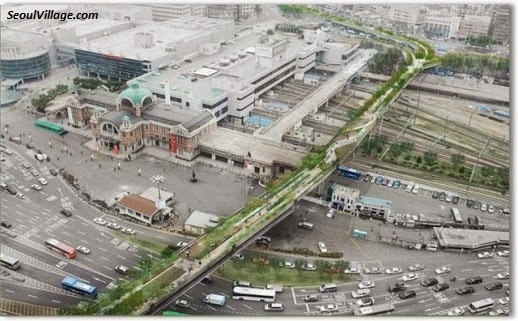 I am much less convinced by the project to create a vast underground pedestrian network connecting major Jongno-gu landmarks. That would signal a return to a car-centric past when pedestrians where parasites that had to move underground, like ants or termites, across downtown Seoul. I suspect this project to have something to do with the one I mentioned last fall, which would move Gwanghwamun Square sideways, and re-transform Sejongdae-ro into a highway (see "Gwanghwamun, Donhwamun, and the Tale of two Royal Roads"). In other words, back to square one, or rather back to Zero Gwanghawmun Square. In the dowtown Seoul I discovered in the early 90s, pedestrians had to either use tunnels or aerial walkways to cross the major roads. 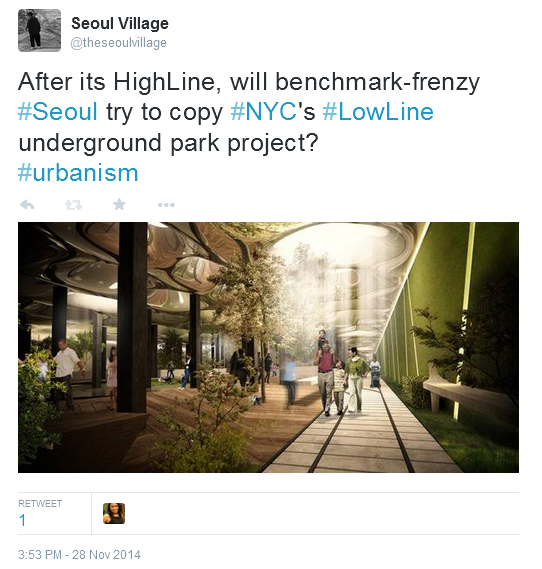 And the Seoul High Line would somehow revive the latter. Named after New York's High Line Park, itself inspired by the Promenade Plantee of Paris, the idea gained momentum in April last year, partly because the city needed to compensate for the planned destruction of an old walkway that Seoulites had deserted because winos had claimed it most of the time. Leaving a landmark in the capital is very good PR, and a tradition for French presidents in Paris: Pompidou and Beaubourg, Mitterrand and the Pyramide du Louvre, Chirac and the Musee du Quai Branly... Note that Giscard missed the opportunity and tried later to claim the Musee d'Orsay as his work, and that Sarkozy didn't understand that he would have only one mandate (and that one building is easier to complete than a Grand Paris - Le Havre vision). Leaving a landmark has also become a must for Seoul mayors eyeing a higher office: LEE Myung-bak had Cheonggyecheon (even if his greatest achievement was the creation of bus lanes), OH Se-hoon had Gwanghwamun Plaza (even if his greatest achievement was the revival of Sadaemun and the rebalancing of Gangbuk vs Gangnam, starting with the redistribution of taxes from the rich to the poor districts), and PARK Won-soon seems to be betting on the Seoul High Line. Last month, Seoul citizens were invited to walk the line on a sunny Sunday afternoon - in other words: to vote with their feet in favor of the project. 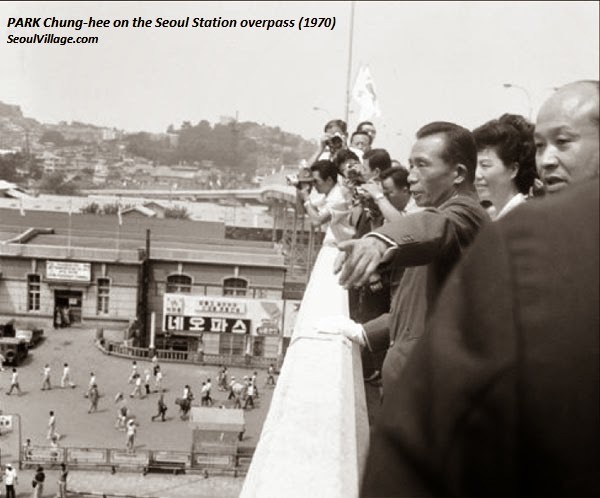 PARK Chung-hee on the Seoul Station overpass (1970). But what fascinates me most is the background, Malli-dong and Kim Gi-chan's beloved Jungnim-dong. Clearly, this walkway looks much better without cars. It is at the same time more scenic and less integrated to its surroundings than its NYC or Paris counterparts. Covering the railways over a wide stretch would cost much more, but also provide a greater urban continuity. One thing is sure: if the taxi and bus corridors in front of the new Seoul Station have allowed the return of pedestrians at street level, the Toegye-ro - Tongil-ro - Sejongdae-ro - Hangangdae-ro intersection remains an utter mess, and with or without the High Line, it will require a complete and sustainable overhaul. 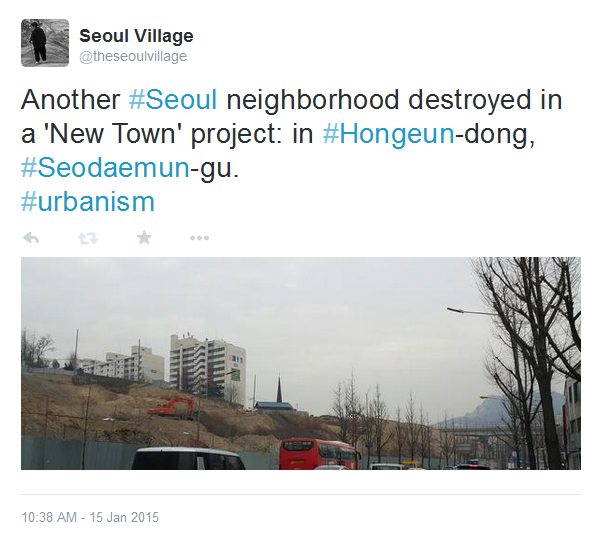 As we've seen countless times New Town out, Redevelopment in, back to the Urban Jungle", "Inhuman, all too human Seoul", the Gyonam-dong saga...), Seoul has not completely given up its old, disfiguring 'New Town' model. 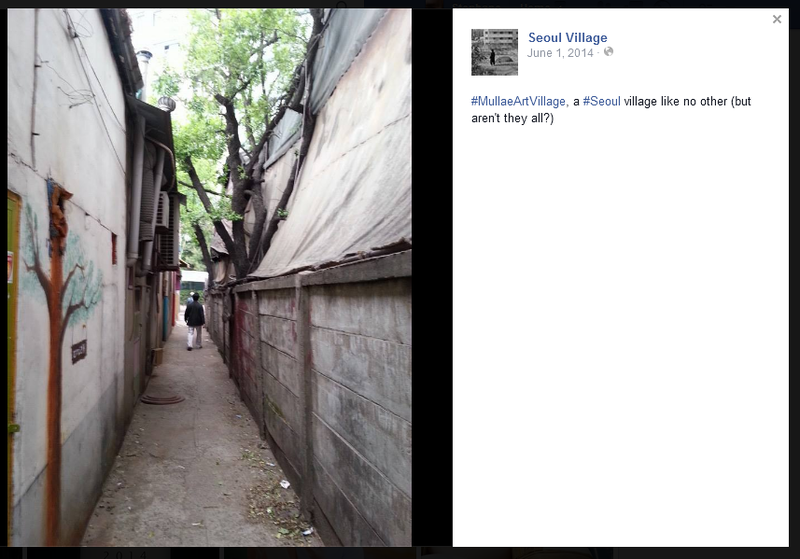 Yet officially, the trend remains to revive neighborhoods instead of annihilating them. After the 'Human Town' / 'Old Town' approach, a concept based on communities (e.g. "Yeonnam-dong, a new Human Town or a new Old Town, but mercifully not that old New Town"), the next buzzword could be 'industrial convergence', a concept based on business verticals or mini-clusters. For the moment, this new umbrella for urban regeneration seems to cover too wide a spectrum, from actual industrial zones to more or less farfetched urban storytelling, with the Seoul High Line as its highlight. Seoul Digital Media City (Mapo-gu): I already wrote quite a lot about Sangam DMC (see all posts). I'll just add that it's already a national cluster for media and IT, so this is less about 'urban regeneration' than about piggybacking on existing dynamics. Note that the arrival of MBC was one of the few recent changes that helped put the DMC on Seoul's popular culture map: they instantly used their outdoor space to stage events and concerts (from their inauguration to the new year party), integrating the neighborhood in their broadcastings, a bit like Fox News on NYC's Avenue of the Americas. Seoul Station (Yongsan-gu): the verticals selected are history and tourism, more symbolized by the old station turned into Culture Station 284 than by the future High Line. Seoul Station itself will be beefed up as a key entry point to the capital, and many redevelopments are already under way in its vicinity (e.g. along Hangangdae-ro, Malli-dong, Seosomun Park...). 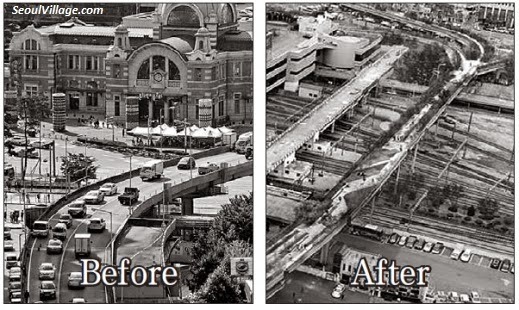 Again, the High Line cannot be the only way to solve the urban mess at ground level. Yeongdonggwon (Gangnam-gu - Songpa-gu): that's around coex and Jamsil Sports Complex, plus of course Hyundai's future HQs. This area didn't need to be wrapped under the MICE (Meetings, Incentives, Conferences, Exhibitions) banner. Seun Sangga (Jongno-gu): inaugurated in 1967, KIM Swoo-geun's fascinating cruise ship forms a long bar between Jongmyo and Chungmuro. Its upper segment was destroyed a few years ago to make room for a small park on Jong-ro, but the reopening of Cheonggyecheon somewhat revived its crux. The whole neighborhood is a DYI paradise now roamed by more contemporary makers in search of odd parts and bits, and Seun Sangga's upper floor hosts the FabLab Seoul (got a project? need a 3D printer or a laser cutter? that's the place). Can this unique start-up hotspot avoid gentrification? Let's hope that at least, its safety will be improved - you don't want to be caught in a fire around here. Chang-dong - Sanggye (Dobong-gu, Nowon-gu): back to Nowon's most coveted space: the Changdong train depot and the Dobong Driver's License Examination Center form a humongous site in Sanggye-dong*, a densely populated area full of apartment blocks divided in very small units. I've regularly posted about Nowon since my 2006 focus, often about subway projects, and always with this site in mind. Back in 2012, it was envisioned as a coex-style complex (see "Nowon confirmed as Seoul's northeast hub "). 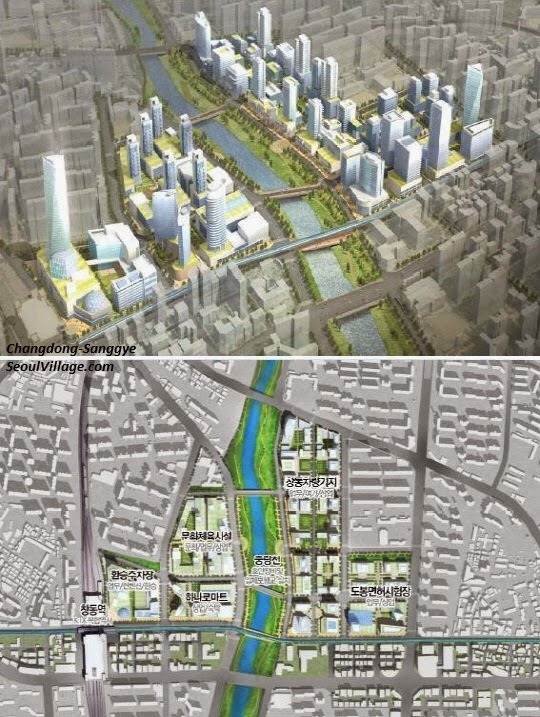 Last year, the four sections of the project were detailed: the train depot would become a 'Global Business Zone', the drivers center a 'Start-up Zone', and the two blocks on the other side of Jungnangcheon, in Chang-dong, a 'Global Life Zone' (leveraging on cultural and shopping venues built over the past decade). Now the focus is biotech. Whatever. Because of the real estate pressure, the only way here is up. Changdong (Dobong-gu), Jungnangcheon, Sanggye (Nowon-gu). And more towers all over. Mullae-dong - Yeongdeungpo (Yeongdeungpo-gu): a couple of blocks away from Seoul's Time Square, 'Ironworks alley' (철공소 골목) is not only a fantastic spot for post-industrial photo ops, but also a nest for young artists and designers. Or was, until recently: the usual curse of real estate speculation went even faster than for previous arty neighborhoods. Janghanpyeong (Dongdaemun-gu): not exactly Seoul's most glamorous neighborhood (between Jangan-dong and Yongdap-dong, between the Naebu and the Dongbu expressways, West of the Cheonho Bridge knot and North of the water treatment plant), Janghanpyeong is known as a hub for used cars hunters, and that's the way the city wants it to remain. It could have some potential, though, once the water treatment is transformed into a more welcoming park. All this is supposed to follow the model of a successful urban regeneration (! ): Bukchon. And all this is not supposed to bring confusion with the 5 zones presented last month. 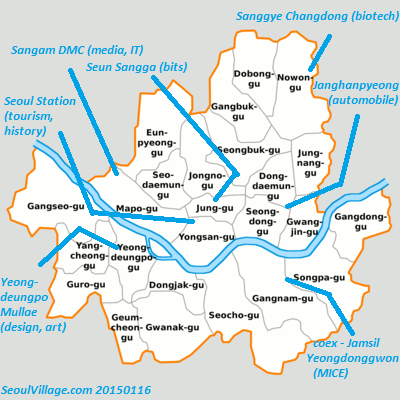 Seoul districts have been divided into five sectors: Seonamgwon (SW, project in Sangdo-dong, Dongjak-gu), Seobukgwon (NW, project in Sinchon), Dosimgwon (Center), Dongbukgwon (NE, projects in Seongsu-dong, Seondong-gu, and Jangwa-dong, Seongbuk-gu), Dongnamgwon (SE, project in Amsa-dong). 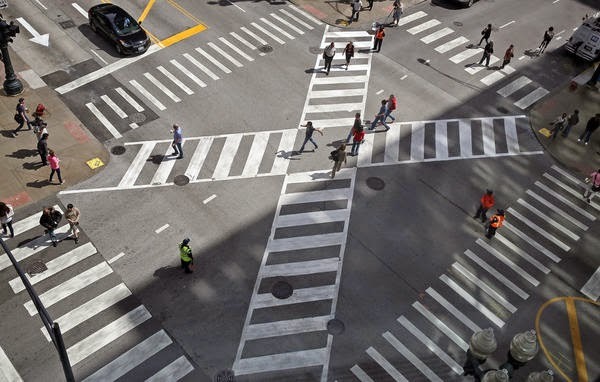 See all posts related to urbanism and urban planning. * Yes, Chang-dong is in Dobong-gu, but Nowon split from Dobong in 1988, when the New Town was delivered (after a resistance narrated in Kim Dong-won's great documentary the Sanggye-dong Olympics). 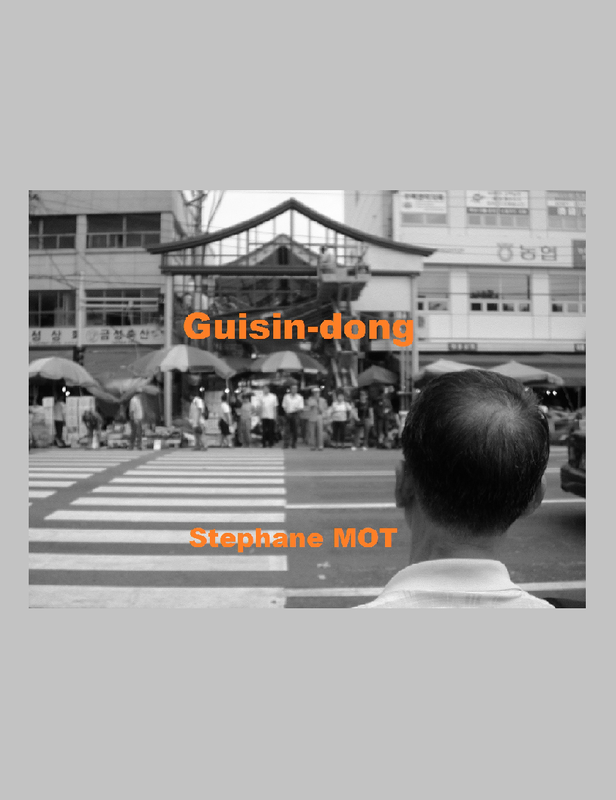 Note that Dobong, itself a spin-off from Seongbuk-gu (1973), was later split in two, spawning Gangbuk-gu in 1995. Last time I did that for a satirist was in 1988, when Pierre Desproges died 'of a short and funny illness', as he dubbed cancer in the epitaph he wrote for the occasion. But precisely because Desproges died of the cancer he said he wouldn't get because he was against it, I had time to mourn him long before he passed away*. Yesterday, Cabu was murdered with AK-47 rifles. 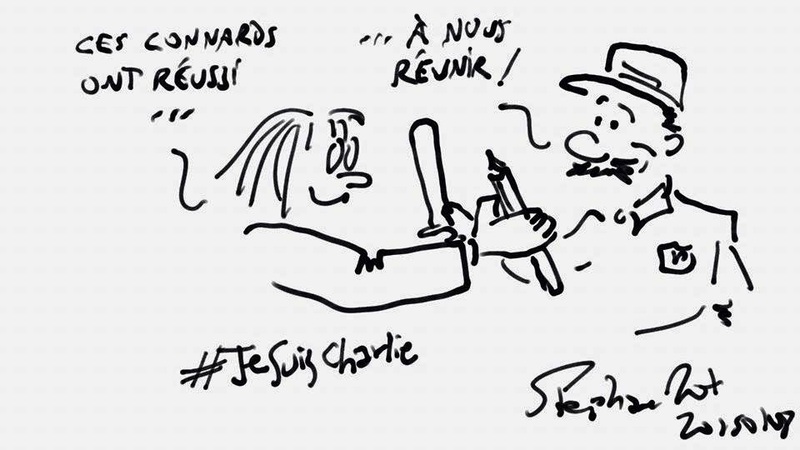 Among the other victims: fellow journalists, cartoonists, Charlie Hebdo employees, policemen... humans who chose to fight against different kinds of cancers (the kind that can eat away whole societies). 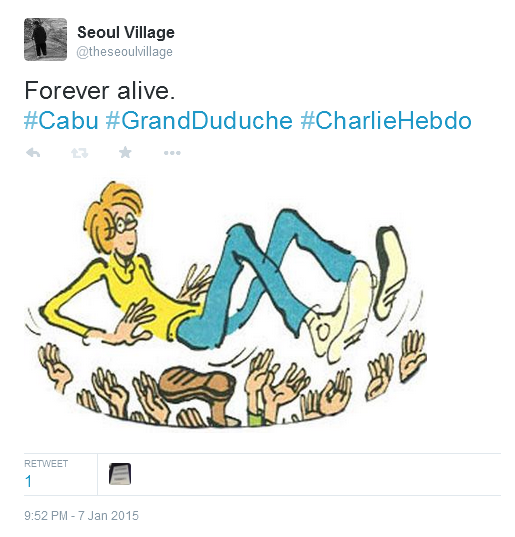 The image that sprang to my mind, when I learned that Cabu had been assassinated, was his 'Grand Duduche', a misfit who, disarmingly candidly, exposes the misfitness of our times. Of course, I preferred Cabu the acerbic caricaturist, just like I adored the ferociously provocative Desproges. But these two mighty pens were carried by two true humanists. And each time I think of them, I first see two kids with irresistibly facetious smiles. If death ultimately claims us all, humorists tend to develop a special relationship with it on the way - I actually define humor as the ability to accept death in general and one's weakness in particular, in order to make life in general more acceptable, and one's existence in particular more bearable to others. 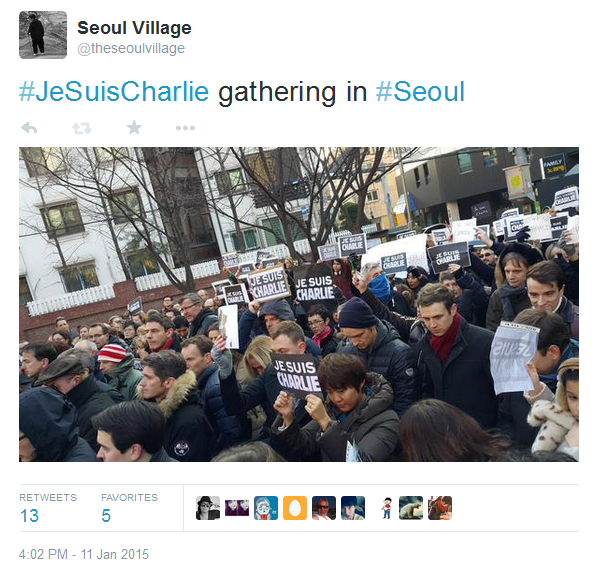 UPDATE 20150112: yesterday, over 300 showed up for the #JeSuisCharlie rally in Seorae Maeul, hundreds of thousands across the globe, millions in France. * and long after, of course - see "Peut-on rire de la mort ?" (1990), "20 ans de séparation" (2008). NB: Desproges was born a few months after Cabu, who would have turned 77 next week.